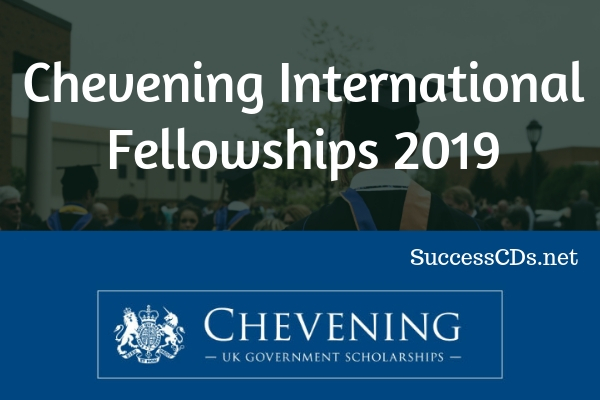 Chevening International Fellowships - Chevening has invited application for interested and eligible candidates for an opportunity to study in the UK. The scholarship will be provided to pursue a one-year master's degree in any subject at any UK university for the academic year 2019-20. Applications for 2019/2020 Chevening Scholarships are open between 06th August and 06th November 2018. These scholarships are awarded to outstanding professionals from your country and beyond to pursue a one-year master�s degree in any subject at any UK university. Chevening Scholarships are offered by the Government of UK in collaboration with UK Universities. Have an undergraduate degree that will enable the candidate to gain entry onto a postgraduate program at a UK university (Equivalent to an upper second-class 2:1 honors degree in the UK). Meet the Chevening English language requirement by 11th July 2019 (IELTS overall 6.5, with minimum 5.5 in each component). Below are the dates for Chevening International Fellowships.